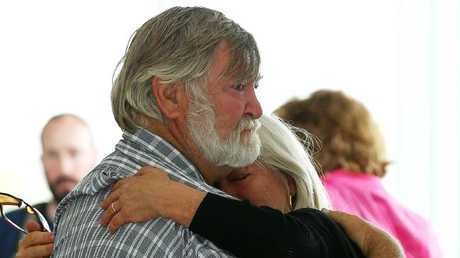 THE shaking and exhausted survivor from Queensland's trawler tragedy gave his rescuers a hug after being plucked from the water and told them: "I'm just so glad to see you." 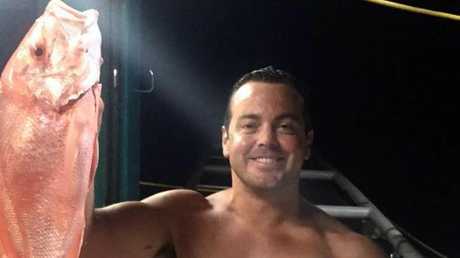 Ruben McDornan spent hours treading water in rough seas with no life jacket before passing catamaran On the Level spotted him floating kilometres from shore. For the first time The Courier-Mail can reveal the miraculous survival story and the extraordinary details of how he was rescued. Speaking for the first time about saving Mr McDornan's life, his rescuers said it was "pure luck" they crossed his path as they sought a safer location to ride out bad weather. "He was tired, he was exhausted, he was shaking, he was dehydrated and adrenaline kept him going," one of his rescuers, Lyn, exclusively told The Courier-Mail. 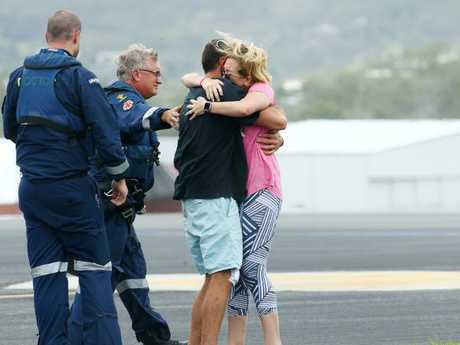 An emotional Mr McDornan was reunited with his wife Sammy yesterday, sweeping her up in his arms at Gladstone airport after being flown in from Agnes Water on a rescue helicopter. 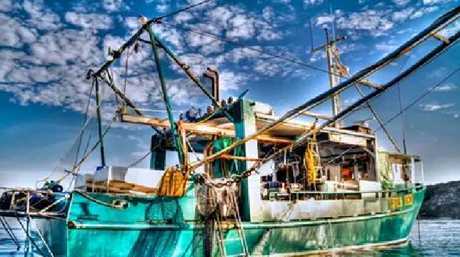 He was barefoot and limping, with police revealing he had been injured trying to get out of the trawler Dianne when it overturned. Six of his best friends remained missing, feared dead, with searchers saying it would be a miracle if any were discovered alive. Desperate relatives refused to give up hope and yesterday chartered a vessel, Saratoga, to perform their own search around Bustard Bay where it is believed the trawler sank. Four people were on the 38ft catamaran On the Level, heading to the Whitsundays. After anchorage problems at the town of 1770, they were on their way north to Pancake Creek on Tuesday morning when they passed within a few metres of Mr McDornan. At first the catamaran passed without stopping. Panic-stricken, he started shouting. But he had been seen by those on the vessel, who hastily turned around and motored back towards him. As his rescuers approached he came in and out of view in waves of 2m to 3m. "He didn't call at first because we went so close to him and he thought we saw him," Lyn said. "When we sailed past he got upset then because we didn't stop. But we were under sail, so you've got to pull your sail in." The trawler's EPIRB hadn't gone off "so nobody knew the boat had been sunk". "He was just so lucky. He was just in our line of where we plotted to. "He's a fit young man, which kept him going, because they were rough waves." Another of his rescuers, Barry, said the seas were tossing and turning with not a single other boat in sight. "You could see him and then you couldn't see him. "One of us kept our eye on him all the time, which is the normal drill. I went and got the lifebuoy and rope, I threw it in and he grabbed it. "He looked in quite good shape apart from very, very red eyes. He would have been in the water for a long time. Mr McDornan "just wanted a hug", and Barry gave him one. Dismissing any notion of heroics, the pair did not want their full names to be published. Lyn said they had simply done what anyone would do, describing Mr McDornan as a "lovely man". "That's what is the most upsetting part. He's just this beautiful guy out in a fishing boat, doing what he loves doing and then this happens. "That young man, he would have lost his life in another hour or so. (It was) pure luck and we knew what to do." Police say Mr McDorman clung to the upturned trawler for up to six hours and then trod water and drifted for another six hours. He was at least a few kilometres from shore when rescued. The search is now moving into a recovery phase, with police divers set to use sonar equipment today to search the seabed. "It would be a miracle if we were to find someone alive," Inspector Darren Somerville said. Mr McDornan had told police the "weather was terrible" when the trawler capsized. The vessel was not anchored at the time, and Mr McDornan was not on deck, he said. "He's just told us that the vessel rolled over," Insp Somerville said. "He's distraught. He's lost six of his best mates. He doesn't know where they are. "As far as physically he has some scratches and bruises which were caused by him trying to get out of the vessel." For the families of the other men, "reality has started to hit". "They're very upset and I think it's going to be harder as time goes on." Search and rescue co-ordinator Sergeant Jeff Barnett said: "The time frame for survival ... has passed." The trawler Dianne was fitted with a tracking system. The weather "hasn't been favourable" but conditions were expected to improve. Wetsuits, spear gun holders, hoses and oxygen cylinders from the capsized boat had been located, mostly washed up on shore at Bustard Bay. "It gives us an indication of where to back track and to look but it doesn't give us a definitive area," Sgt Barnett said. "The majority of the debris we've located so far appears to have come from outside the vessel, not from the inside. "It would appear then the vessel may still be intact where it is, which is a good thing. However, it still doesn't really give us a definitive answer to where it is or what happened."